While U.S. sanctions on state-run oil company Petroleos de Venezuela - known as PDVSA - have crimped crucial crude exports, Maduro retains the support of Russia and China. Maduro did not appear at a Socialist Party rally in Caracas on Saturday, where his allies declared "victory" over the opposition's efforts to remove him for power. "They are threatening to go to Miraflores," Diosdado Cabello, the party's vice president who leads the all-powerful National Constituent Assembly, said in a speech. "We cannot allow that. They left from there before, and they will never again enter the palace of the revolutionary people." "I am certain we will move forward," said hairdresser Irasai Torres, 60, who attended Guaido's speech in Valencia, which has been hard-hit by factory closures and the departure of foreign firms. "My life is at a crossroads - we never have water, electricity has been going out for years, and we need to wait in line for food. We do not deserve this." 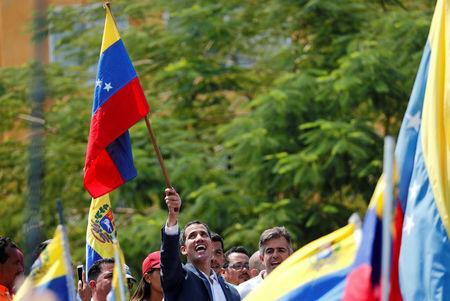 Maduro has blamed a U.S. cyberattack for the outage, and this week the country's chief prosecutor asked the Supreme Court to probe Guaido for alleged involvement in "sabotage" of the country's electricity system. But local electrical engineers told Reuters the blackout was the result of years of lack of maintenance.